Hydraulic press is a mechanical device which is based on the ‘Pascal’s law’ which states that equal intensity of pressure exerts on all the directions in a closed system. It applicable here in such a way that if there is any pressure change at one point in a closed system then same intensity of pressure will change at other point in the same system. Above relations shows that by adjusting the area of the ram and plunger we can able to use it in several applications where we can easily develop high forces by applying only small amount of force. In practical hydraulic press system, generally multiple rams are assembled together. The number of rams used depends upon the working load. 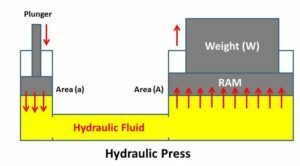 In hydraulic press multiple rams of small sizes are preferred instead of a single large size ram to control the thrust forces because it is easy to control the thrust forces on small size as compare to large size. In press assembly one side/table is always fixed while the other is moving by the application of ram force and in between fixed as free side pressing operation is take place. Ram is operated by the hydraulic pressure of fluid. The high pressure liquid is supplied by using pump and hydraulic accumulator. 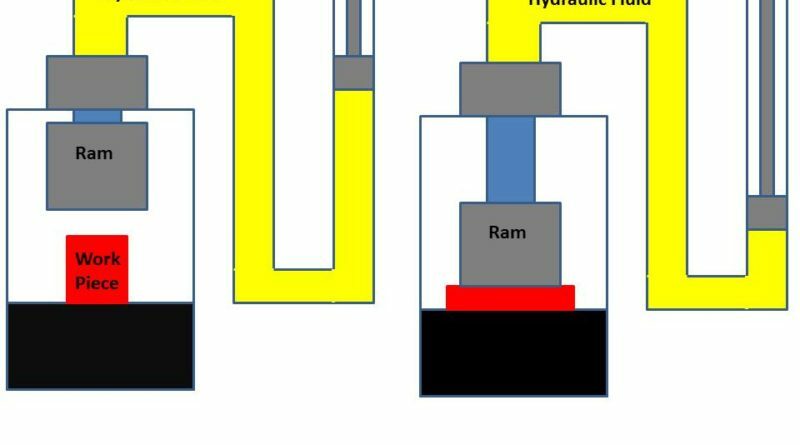 Hydraulic accumulator works as the junction between the pump and the rams. Hydraulic accumulator stores the high pressure liquid when press is at stationary position. Hydraulic press is used where high thrust is required for operation. The major application of the hydraulic press is in industry where big size metal objects transform into thin sheets by the application of pressure force. In crushing of scraps and old vehicles. 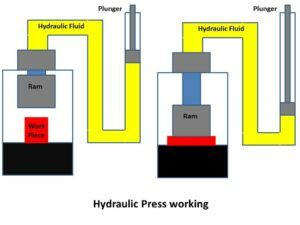 This is basic introduction about hydrualic press. If you have any query regarding this article, ask by commenting. If you like this article, don’t forget to share it on social networks. Subscribe our website for more informative articles. Thanks for reading it.